Just like in WinUI, you can add multiple pages to your WebUI. To see the list of available pages in your WebUI, press the ‘hamburger’ icon on the top left position of your browser window. The Page Manager (a page tree) will open. Please note that the new Page Menu and Page Manager are available in AIMMS 4.40+. 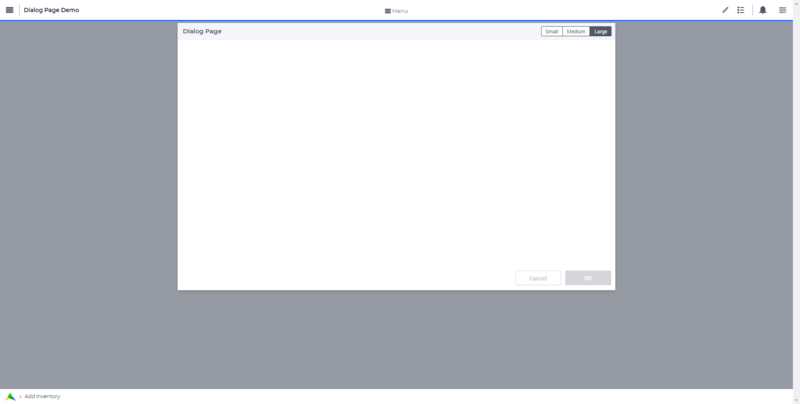 From AIMMS 4.45 onwards, the Page Manager can also be used when running your WebUI app on PRO. You can expand a subtree by clicking on the ‘arrow’ “>” in front of a parent page. You can collapse it by clicking on the “v” in front of the parent page. 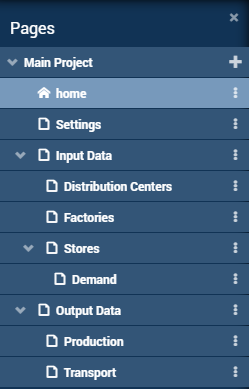 The pages in the Page Manager will always be visible in the Page Menu, unless the visibility of a page is set to either ‘false’ or 0. Sidebar Open By Default Use this option to specify whether the Page Manager sidebar should be visible upon opening the WebUI app. Page Manager Hidden Use this option to specify whether you want to offer the Page Manager to your end users or not. Page Menu Hidden Use this option to specify whether you want to offer the (horizontal) Page Menu to your end users or not. When running on PRO, only the add/rename/delete options are offered to the end-user (i.e. the visibility-toggling and the wizard-creation options are left out). Press the ‘hamburger’ icon on the top left position of your browser window. A page tree sidebar will open. By default, one page is available, called ‘home’, located in the ‘Main Project’. Press the plus button behind ‘Main Project’. Specify a name for your new page and press the Enter key to add the new page to the list of available pages. Press the Escape key if you want to cancel the creation of the new page. Press the ‘hamburger’ icon on the top left position of your browser window. Press the dots button behind the parent page of your new subpage. A list of page control buttons appears. Press the plus button to add the subpage. 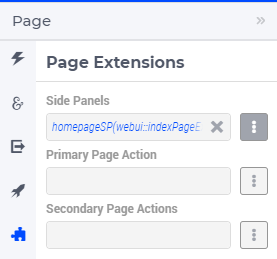 Specify a name for your new subpage and press the Enter key to add the new subpage to the list of available pages. Press Escape if you want to cancel the creation of the new subpage. When entering the new name, a red line around the name input field can appear, meaning that the current name will not be accepted. E.g. when a page name already exists at this level in the page tree. To navigate to the newly created page, press the page in the list of available pages in the Page Manager or in the Page Menu. After adding a page, you can add widgets to it. There are some changes made to the page manager with the introduction of Side Panels from software version 4.64. The changes are explained in Adding a Side panel Page. Press the dots button behind the page that you want to rename. A list of page control buttons appears. Press the pencil button to rename the page. Specify a name for your new page and press the Enter key to commit the new page name. Press the Escape key if you want to cancel renaming the page. Click on the page that you want to move and hold your mouse button down. Move your mouse to the new position in the tree. Subtrees will automatically expand when hovering over them. A little triangle will indicate the new position of your page. If the triangle is on top of another page name, your page will end up just above this page. If it is at the bottom of another page name, your page will end up just below this page. If it is in the middle, your page will become a subpage of the other page. Release your mouse button to perform the move to the new position. Press the dots button behind the page for which you want to change the visibility. A list of page control buttons appears. Press the eye button to open the visibility option for the page. Specify a value for the visibility option and press the Enter key to commit it. Possible values are ‘true’ or 1 (visible), ‘false’ or 0 (hidden), or an AIMMS identifier that contains one of these values. By specifying an AIMMS identifier for the visibility option of a page, you can dynamically control from within the AIMMS model, which pages should be visible on a certain moment. When a page is hidden, it will not show up in the Page Menu. In the Page Manager, hidden pages are ‘grayed out’ and they have a ‘hidden’ icon behind their name. Press the dots button behind the page that you wish to delete. A list of page control buttons appears. Press the bin button to delete the page. In the Page Manager, the first page in the Main Project has a home icon . This means that when opening your WebUI app (in develop mode or in PRO) you are automatically being navigated to this first page. By default, there is one page in your WebUI app called home. This is the first page and thus the ‘startup’ page. However, as an app developer you can make another page the startup page if you want, by moving another page to the first position. This automatically makes this page the new startup page. Of course, if you just want to give the default home page another name, you can do so by renaming the page. or Start wizard/Finish wizard in case of the first/last page. a confirmation page that provides some information about what will happen next (result page). During this process, the user can cancel the process. Such a shopping cart wizard will guide the user through a set of pages and it will make sure that all the necessary data is provided and handled in the way it should. E.g. no order is placed when the user is still unknown. Press the dots button behind the page that should be the start page of your wizard. A list of page control buttons appears. Press the wizard button to create or update the wizard. The Wizard editor will pop up. After having made your changes, you can press the Create wizard/Update wizard button at the bottom of the Wizard editor. To delete a wizard, use the Delete wizard button at the top of the Wizard editor. The Wizard editor allows you to select the pages that should be part of this wizard. If you want to select more than three pages, you can use the Add page to wizard button. For every page, you can specify a start and end procedure. You can move the pages up or down to change their order in the wizard. You can delete them from the wizard by using the little bin icon behind the page row in the Wizard editor. In case all the pages for a certain wizard are subpages of the first wizard page, you can also change the order of the pages by using the Update list from page tree button. 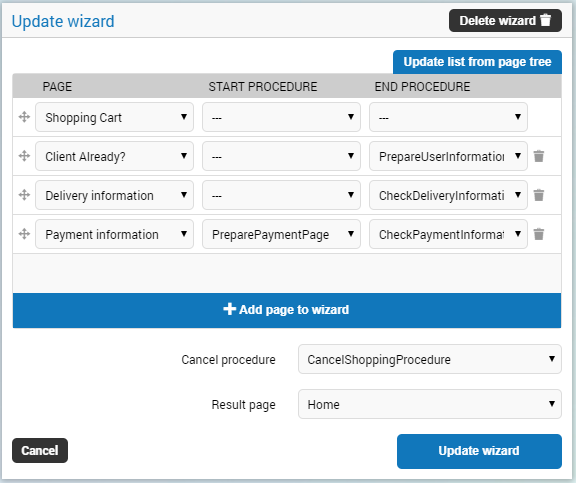 When you change the order of the pages in the page tree, this button allows you to easily apply these changes to the wizard page order as well. In the Wizard editor, you can also specify a cancel procedure that will be run when the user presses the Cancel button when going through a wizard. When the user presses the Finish wizard button on the last page of the wizard, the user will be directed to the Result page specified in the Wizard editor. When the user cancels the wizard, a Cancel procedure is called that can also be specified in the Wizard dialog. When the user finishes the wizard by pressing ‘Finish wizard’ on the last page, the user is directed to the ‘Result page’, which can also be specified in the Wizard dialog. Inside the procedures, the app developer can assign values to these arguments. E.g. The statusCode value at the end of the end/cancel procedure will decide whether or not to continue. This means that in case the statusCode is not 200 (‘OK’), the user will remain on the current page. The WebUI will display the statusDescription string to provide the user with extra information. In case the statusCode is 200 (‘OK’), the user will continue to either the next page (in case of an end procedure) or the wizard will be canceled (in case of the cancel procedure). The statusDescription in such a case will only be displayed when it is not equal to “OK” or “”. Side panels are available in software versions from AIMMS 4.64 onwards. Side panels are 2 column width pages that can be configured with different widgets and accessed on different/all pages in an application via tabs on the right-hand side of the page. Side panels help build model interactions. These help to free up real estate on pages, or also duplicate widgets that are required on different pages, such as filters. 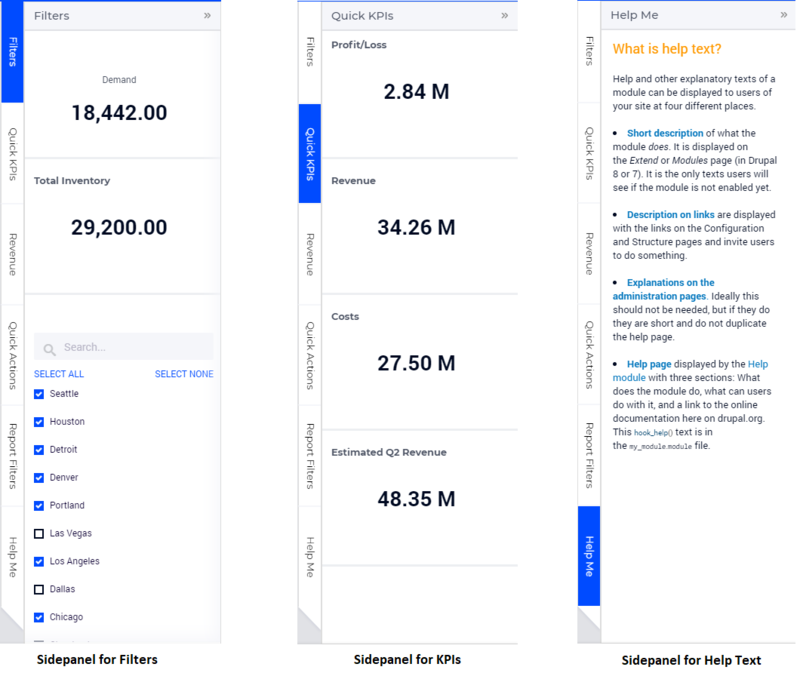 Side panels can be used for various purposes, such as filters, displaying KPIs, making quick notes, showing help text. Adding a side panel page is similar to adding a page. In the page manager you will notice a few changes. The icon for the Main project and in the menu for other pages has been replaced. The main project now has a menu, which when clicked, shows 2 options, i.e. Add New Page and Add Side panel . The icon for pages has been removed and 2 new icons have been introduced and , as in the main project add options. Click on the Insert side panel page icon and give it any name you desire. You cannot give a name that you have already used for other pages or side panels. You can differentiate between pages and side panels by the icons that represent each type. Side panels can be added to any level in the page tree, just like any normal page. Unlike Pages, Side panels do not appear in the Menu (navigation) and can only be accessed via the page manager. Side panels has the same options of a page i.e Rename, Delete, etc. You can also move the side panel the same way pages can be moved. Avoid adding pages under side panel pages. These pages will not be shown in the navigation menu. Adding widgets to a side panel page is the same as adding widgets to any other page. Step 2: You will see a 2-column width page. Open the Widget Manager. Step 3: Add desired widgets to the page. Changing the width of a widget will not have any effect as the page is restricted to only 2 columns. You can change the height of the widget as required. If the widgets added exceed the page height a scroll will appear in the side panel. Side panels can be configured by the application developer via the AIMMS model. Firstly, create a set for the order of side panels to be displayed on the page. For illustration, let’s call this set “SidePanelOrder” with index SP_order (as a developer, you can give this set a name and an index of your choice). This set determines the order in which the side panels tabs will appear from top to bottom. This set must be a subset of the pre-declared set of Integers. A new section has been added to the AimmsWebUI library called Pages and Dialog Support, used to configuring side panels. The set SidePanelSpecification declared inside the Pages and Dialog Support section is used for configuring the side panels as illustrated here in the next steps. displayText: Is the text/label you would like the side panel tab and header to have. pageId: When a page or side panel is created it is has a unique pageId. 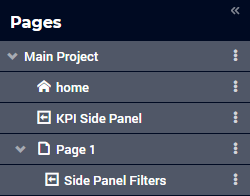 You can find all the side panel pageIds in the set AllSidePanelPages. tooltip: The text here would be displayed when the user hovers over that respective side panel tab. state: This is the state for the side panel, i.e Active and Hidden. If the set AllSidePanelPages is not yet filled with all side panel pages, please run the procedure GetAllPages. You can find this procedure in Page Support section under Public Pages Support Procedures. The “state” property is not yet in use, but will be applicable in future releases. In side panels it is considered as Active by default. You can use domain conditions to show or hide side panels on a page. Side panels appear in the same order from top to bottom as they appear in the data of the string parameter. If you enter an incorrect pageId, then the corresponding side panel tab will not be shown. 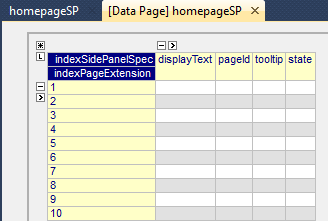 Add the string parameter created for that respective page in the side panels field. Once you have added the string parameter, the respective side panel tabs will appear on that page. Similarly, you can create some (other) string parameters for other pages and configure them using the same steps. You can configure as many side panels as you need in your application. However, please note that, since there is limited screen space, AIMMS WebUI only displays the top 6 side panels on each page. A side panel can be opened and closed by clicking on the respective tab. Hovering over a side panel will show you the tooltip that was configured in the model. Clicking on the tab highlights that tab and slides opens with the widgets that were added to that respective side panel page. Dialog pages are available in software versions from AIMMS 4.65 onwards. Dialog Pages are used for intermediate actions or steps in your workflow. You can build model interaction by calling dialog pages for the user to perform a specific action such as setting SLA’s or adjusting inventory etc. 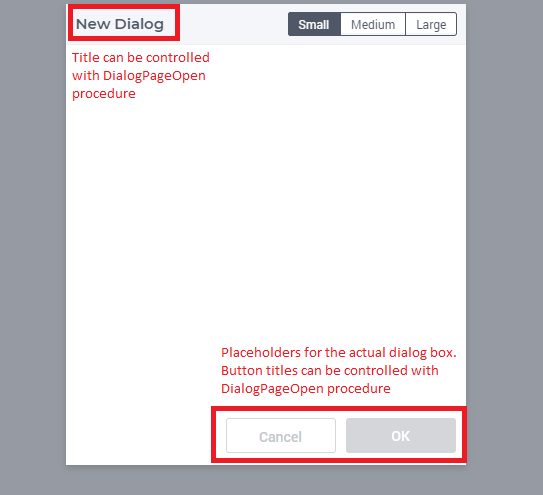 In addition, you can use Dialog pages to display information about a selected item without breaking the flow by calling the OpenDialogPage function. For example showing the detailed properties of a scheduled batch. A dialog page has one of three predefined sizes: Small, Medium and Large. Dialog pages can have up to 3 buttons, 2 of which are shown by default, typically Cancel and OK. The text and callback procedures for these buttons can be controlled via the OpenDialogPage function. When a dialog box is open, the user can interact with the dialog only. The dialog box can only be closed by clicking on one of the actions. Adding a dialog page is similar to adding a page or side panel. Click on the Insert Dialog page icon and give it any name you desire. You cannot give a name that you have already used for other pages, side panels or dialog pages. Dialog pages can be added to any level in the page tree, just like a normal page. 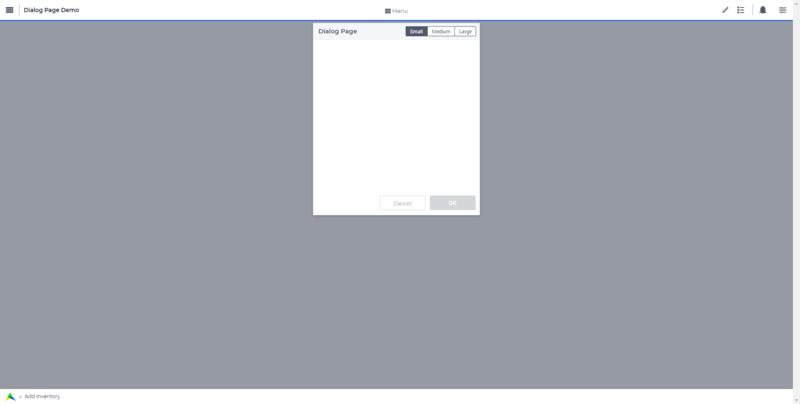 Unlike Pages, Dialog pages do not appear in the Menu (navigation) and can only be accessed via the page manager. Dialog pages have the same options as a page or side panel, i.e. Rename, Delete, etc. You can also move the dialog pages the same way pages can be moved. Small: Width = 3 Columns, Height = 2 Rows. 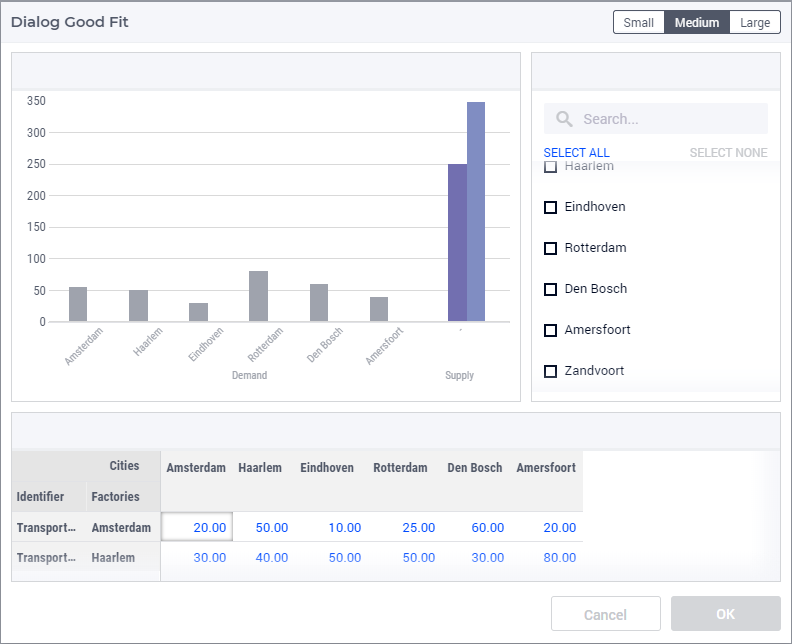 Here you can fit widgets with dimensions that add up to 3 columns and 2 rows, e.g. 1 widget with width = 3 columns or less and height = 2 rows or less OR 2 widgets with width = 3 columns or less and height = 1 row. Medium: Width = 6 Columns, Height = 3 Rows. 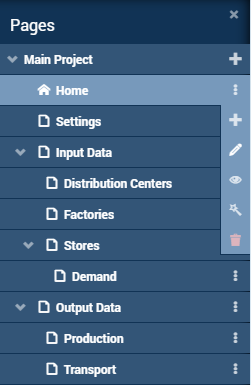 Here you can fit widgets with dimensions that add up to 6 columns and 3 rows. Large: Width = 8 Columns, Height = 3 Rows . 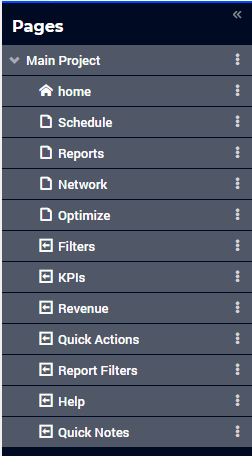 Here you can fit widgets with dimensions that add up to 8 columns and 3 rows. The title and action buttons on the dialog page can be configured via the model. These are placeholders to depict how the actual dialog page will look. This also gives an idea of the usable area for adding widgets in the dialog page. Avoid adding pages under dialog pages. These pages will not be shown in the navigation menu. Adding widgets is the same for dialog pages as it is for normal pages or side panels. Select a desired size by clicking on the respective button in the top right corner of the dialog page. Open the widget manager and add widgets that are needed. When the height of a widget exceeds the height of the dialog page, the widget will be clipped, as Dialog pages do not have a scroll bar. Pick a suitable size for the dialog page and the widgets you want to have in the dialog page. You can change the size of the dialog page any number of times when in developer mode. The Small, Medium, Large buttons are not available to end users, so the sizes cannot be changed once the application is published. 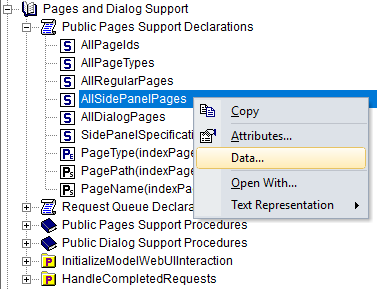 The procedure OpenDialogPage(pageId,title,actions,onDone) needs to be used to invoke dialog pages on the desired page. The button names are assigned from left to right from the defined set. If the set has only 1 element, only one button will be displayed. A maximum of 3 buttons can be shown. In the case where 3 buttons are shown, the style of the 1st two buttons are the same and the 3rd button is different. 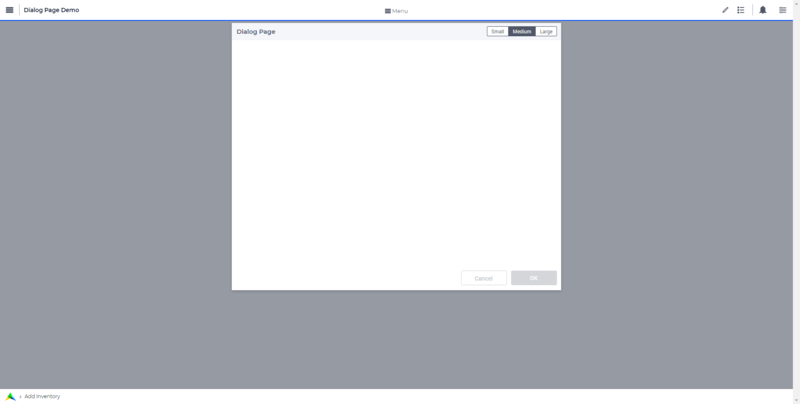 When a Dialog page is open, the user can only interact with the widgets on the dialog page and the dialog page itself. The dialog page can be closed only by clicking on the action(s). The user can move/drag the dialog page around the page. 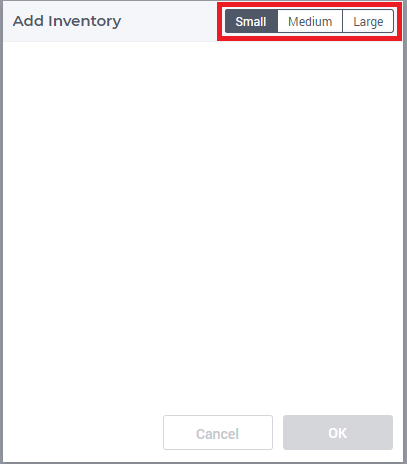 When one dialog page is open, another dialog page cannot be invoked from the open dialog.